Mad Men: That's Some Great Business Sense! 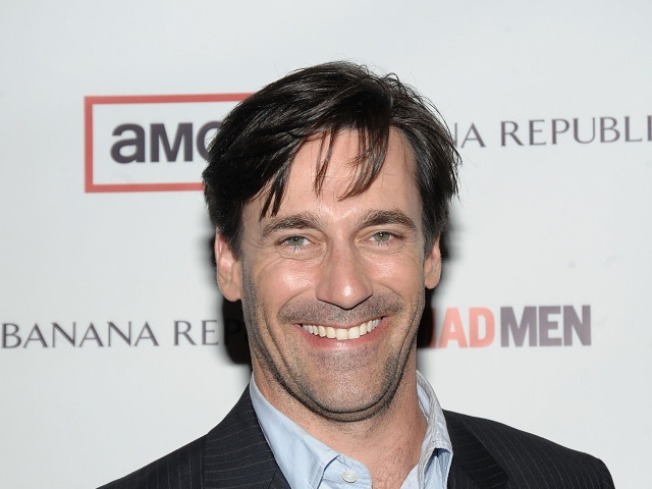 Jon Hamm stars in "Mad Men." Ken, backed up by Harry and Sal (Pete, natch, is not on this account, given what happened last week) wants to use Ann-Margret in Bye Bye Birdie as an inspiration for a campaign to sell the newly-created Diet Pepsi, which has a "working" name of "Patio" at this point. Peggy isn't too jazzed about the concept, finding it vapid and sexist, but the boys are all, "Pish posh, girlie." When will they ever learn? The boys' lack of confidence in her, however, leads Peggy to do an Ann-Margret imitation in front of a mirror, and how much does Elisabeth Moss rule? The next day, Peggy shows Bye Bye Birdie to Don, complaining that the ad idea targets men rather than the actual potential consumers of the product, but Don is unmoved, much to her dismay. On a whim, she stops off at a crowded bar and tries ditzing it up so boys will like her, and soon she's fooling around with a fetus, albeit a relatively nice one. Meanwhile, some grass and a woman (it is not what you think) seem to convince Don that maybe Peggy was right after all. Pete has Paul with him to create that campaign to counter the negative image around the demolition of Penn Station, which turns out to be an issue when Paul expresses sympathy for the other side in front of the clients. Meanwhile, Joan (that's Mrs. Harris to you!) compliments Betty on her pregnancy when she shows up to SC, and mentions that she and Greg will be trying (again?) after he (hopefully?) makes Chief Resident at the beginning of July. Don and Betty then go out to dinner with Pryce and his wife Rebecca, which does nothing to improve Betty's already-foul mood -- you see, Gloria left her father, and she's worried about him, so she's going to have her brother and his wife bring him up. Don's not thrilled, but he doesn't have much choice in the matter. Also, Pryce announces to the senior partners that they lost a big account, and London isn't happy, so they'd better rustle up some new business, and he sends Don and Roger out to clean up the mess that Paul and Pete (mostly Paul) made with the Madison Square Garden people. Mona, Roger's ex, and Roger's daughter Margaret show up to the office to discuss seating arrangements for the wedding, but Margaret doesn't want Jane to come at all, not that Roger really pays her any mind. At the client lunch, Don expresses disdain for Roger's problems before the client show ups and falls under Don's hypnotic spell, although he does make it clear that Paul is not to be allowed within miles of their campaign. Pryce then turns up and tells Don that London is pulling their involvement from MSG, as they don't see it as a long-term moneymaker of an account. Looks like they all have vision as bad as Pryce's. Don's presence at the lunch sticks the very pregnant Betty alone with her in-laws and children, and she gets the lowdown from her brother that he wants to put Gene, the dad, into a facility. Betty is not so much having that, though, thinking that her brother just wants to take over their ancestral home, which she tells him to his face, kind of awesomely. However, when William informs her that the other option is for him to move in with Gene and have his wife take care of him, Betty gets upset, so Don takes William aside and informs him in no uncertain terms that Gene will be living with them while he, William, supports him financially and leaves Gene's house untouched. William reads Don well enough to know not to argue, and soon he's announcing to Gene that he'll be staying chez Draper for the foreseeable future. It doesn't take long for Gene to start acting all crazypants, though. It's the side of dementia the tourists never see.